(Bloomberg) -- Will the stock market’s relief rally continue, or is a return to the lows in store? 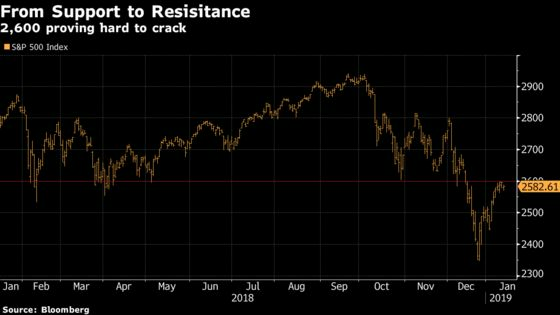 Global equity charts are littered with a host of hitherto impenetrable resistance levels, including many 50-day moving averages that have so far contained the rebound. But, if the resistance is breached, it could help pave the way for future gains. Exhibit A is the MSCI World Index, an index of developed-market stocks. 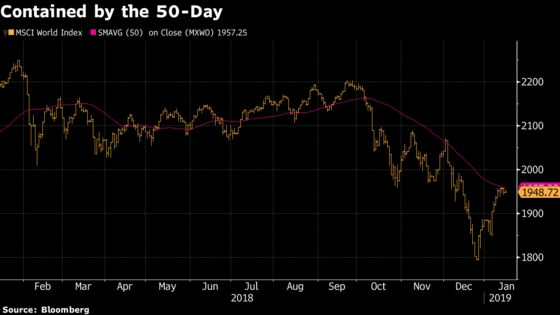 The rally in global equities that started the year has stalled out in the past few trading sessions as the gauge ran smack-dab into its 50-day moving average. Stateside, the S&P 500 Index is staring at support that’s turned into resistance. 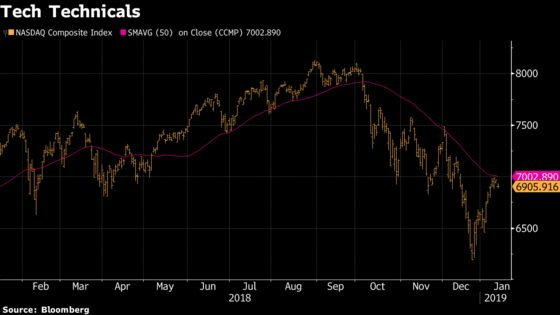 The 2,600 level, which helped define lows in May and October, is now acting as a barrier to the index’s bounce-back from its 9.2 percent drubbing in December. On the first day of December, the Nasdaq Composite Index tumbled below its 50-day moving average. It’s since recovered to within 100 points of that level as of Monday’s close. 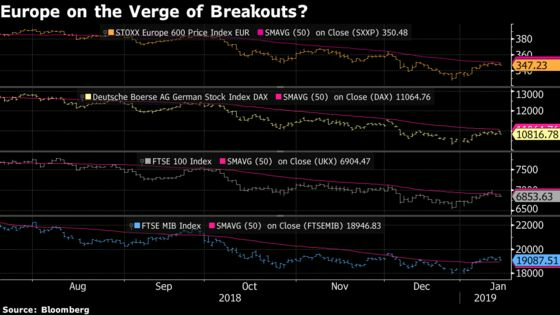 A swath of European gauges are butting up against their 50-day moving averages. The Euro Stoxx 600 is a scant few points away from breaking above this threshold for the first time since Federal Reserve Chair Jerome Powell said rates might be a “long way” from neutral, remarks which were later walked back. Germany’s DAX Index is in a similar situation. After a sojourn above its 50-day moving average, the U.K.’s FTSE 100 Index is back below this level as Parliament votes on the Brexit deal. The bright spot: Italy’s FTSE MIB has been able to sustain last week’s move above this short-term technical level for now. 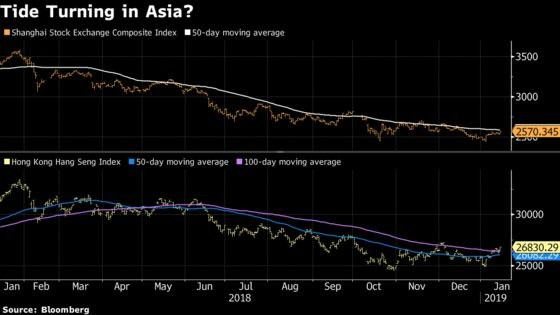 The Shanghai Composite Index is just below its 50-day moving average, a level it hasn’t been able to keep its head above for long since January 2018. The Hang Seng Index’s strong start to 2019 has the collection of Hong Kong-based firms trading above both the 50- and 100-day moving averages for the first time since early December.